German Business School is organizing Saturday, September 15th, 2018 at 1pm a presentation of exchange programs with Germany. A perfect occasion to learn more about the BBA and MBA programs at GBS. In addition to its valuable educational assets, the BBA program at the German Business School allows the students to study abroad and to live a life changing experience. The abroad semester at the University of applied Management Studies (HdWM) in Mannheim is a great opportunity to hone German language skills, have a feel of the German culture, discover new career opportunities and seek personal development. The MBA program, its uniqueness, benefits, learning outcomes and career opportunities will be presented with the abroad start-up session, and MBA-Thesis defense in Mannheim. 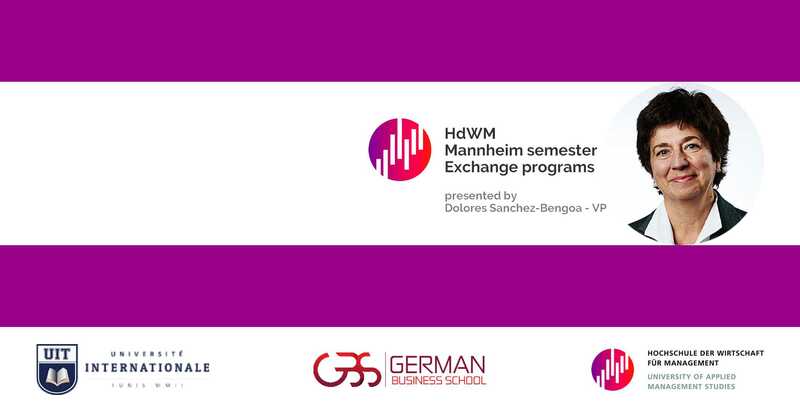 Prof. Dolores Sanchez Bengoa, vice-president of the HdWM ad key speaker of the event, will be presenting the exchange program, giving more insight of the student’s life aspects in their campus. The benefits associated with such program will be discussed and all your questions will be addressed during and Q & R session. You are kindly invited to take part of the event and to come with your questions. They will be addressed by GBS and HDWM representatives.